Entropic Memes has recently published CyberCIEGE Revisited and this is the most exciting gameplay debriefing one could possibly have. Have I piqued your interest, yet? The game is freely available to the U.S. Government and a no-cost license is available for educational institutions. You may also click here to download the free evaluation copy. CyberCIEGE is a Serious Game designed to teach network security concepts. 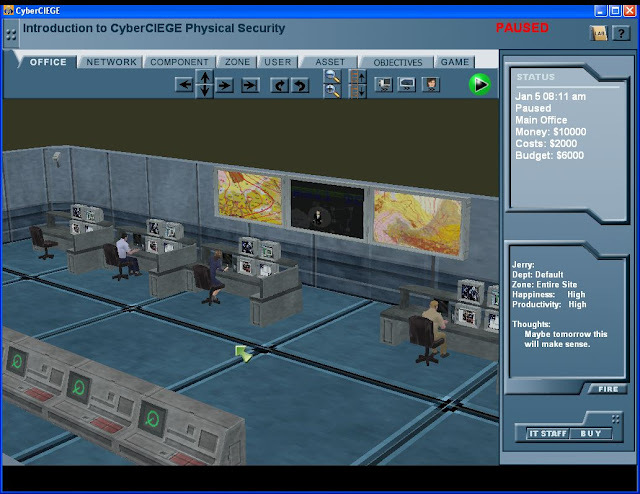 It was created by The Center for Information Systems Security Studies and Research (CISR) at the Naval Postgraduate School (NPS) and Rivermind, Inc.
Development of CyberCIEGE was sponsored by the US Navy, the Naval Education and Training Command, ONR, FAA, and OSD, and it is used as a training tool by agencies of the U.S. government, universities and community colleges. Numerous NPS (Naval Postgraduate School) students have participated in tool and scenario development. The game has tremendous potential for use in cyber security training and awareness as well as for more advanced education. NPS is seeking partners in education to help identify and obtain sponsorship for enhancements to target the game to this new audience. Players purchase and configure computers and network devices to keep demanding users happy (e.g., by providing Internet access) all while protecting assets from a variety of attacks. Break in and steal computers, bribe users, distribute Trojan horses and plant trap doors. In the CyberCIEGE world, players spend virtual money to operate and defend their networks, and can watch the consequences of their choices, while under attack. 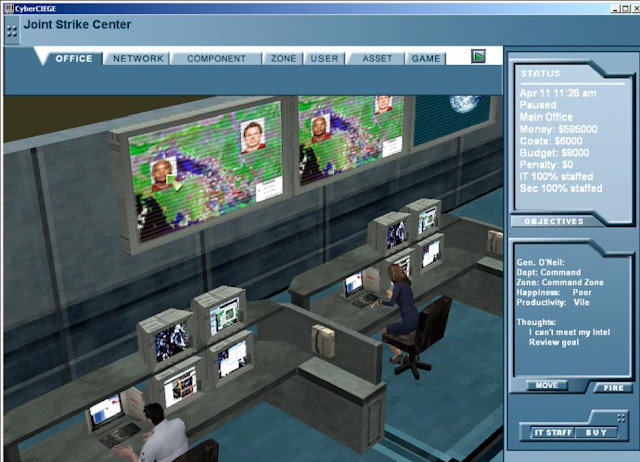 The game includes a number of different scenarios, some of which focus on basic training and awareness, others on more advanced network security concepts. In its interactive environment, CyberCIEGE guides players through a series of scenarios that highlight various training and awareness learning objectives: these include such topics as user authentication, e-mail attachments, antivirus and identity theft. More advanced scenarios cover significant aspects of network management and defense. Players make trade-offs and prioritization decisions as they struggle to maintain a balance between budget, productivity, and security. Players must keep the virtual world’s personnel happy (e.g., by providing Internet access) while protecting assets from vandals and professional attacks. Network security components include firewalls, VPN gateways, VPN clients, link encryptors and authentication servers. Workstations and servers include access control lists (ACLs) may be configured with operating systems that enforce label-based mandatory access control policies. The game also includes identity management devices such as biometric scanners and card readers to control access to workstations and physical areas. CyberCIEGE includes an attack engine that employs physical attacks, network attacks, Trojan horses, trap doors and exploitation of operating system and application flaws. The strength of attacks is driven by the motives associated with each enterprise asset. Thus, some assets might be defended via a firewall, while other assets might require an air gap or high assurance protection mechanisms. The game is designed as a "constructive simulation" set in a three dimensional virtual world. Players build networks and observe virtual users and their thoughts. The game engine incorporates triggers and conditions to allow the scenario designer to provide players with feedback. A "Scenario Development Kit" is available for creating and customizing scenarios.